Welcome to the Reunion Hideaway, a beautiful 5 bedroom villa located in Reunion. Featuring plenty of space to accommodate your whole party, luxurious and comfortable furnishings and the perfect location only miles away from Orlando attractions, like Walt Disney World Resort, Universal Studios and Sea World Orlando. Enter this beautiful home to an open floor plan living area, perfect for entertaining or gathering as a family to enjoy meals or watch your favorite show on the large SMART TV. The dining area has seating for 8, with a breakfast bar with stool seating for 4. The kitchen is fully equipped with all you need to prepare meals for your whole party. One master King bedroom is located downstairs. Head outside to the pool area and find a summer kitchen and outdoor table with seating for 6 to dine al fresco. Soak up some sunshine in plush outdoor lounge furniture or splash around in the pool with a spillover spa. Enjoy the beautiful golf course view! Head upstairs to the loft area with a TV, dart board and a table perfect for playing games. The fun custom built kids bedroom has two twin bunks and a special TV! The upstairs master features access to a private balcony, and the other King bedroom has balcony access as well. The last upstairs bedroom features two comfortable full beds. Play the day away in the fantastic movie and games room! Watch your favorite movie on the projection screen, play one of the arcade games or hang out at the bar with a beverage. The perfect place to relax and make priceless family memories. 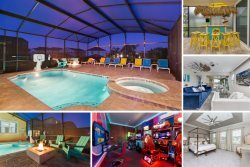 Book your stay today at this beautiful Reunion vacation home rental, perfect for your Orlando family vacation!